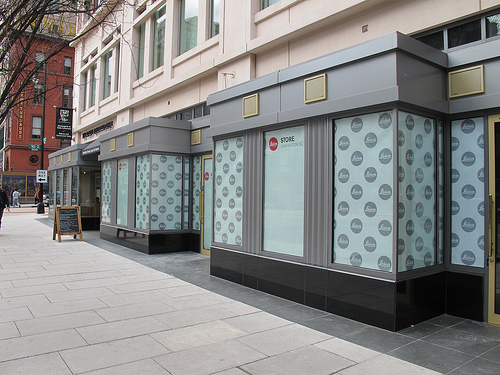 PoPville » Leica Camera Store Still Coming to Penn Quarter? Leica Camera Store Still Coming to Penn Quarter? Casual French eatery Le Pain Quotidien and exclusive retailer of photographic equipment Leica Camera, Inc. will soon fill the last available retail bays at 975 F Street, NW, in DC’s East End. The Leica Camera space is also expected to open before the end of this year, and will include a product showroom, image gallery, and a studio where customers will have the opportunity to try out the company’s finest cameras. The 1,837 square foot boutique will be Leica’s first stand-alone store in the country, although the product line has been preferred by White House photographers and other prominent photojournalists for decades. In Nov. 2011 the Le Pain Quotidien opened at the corner of 10th and F St, NW. 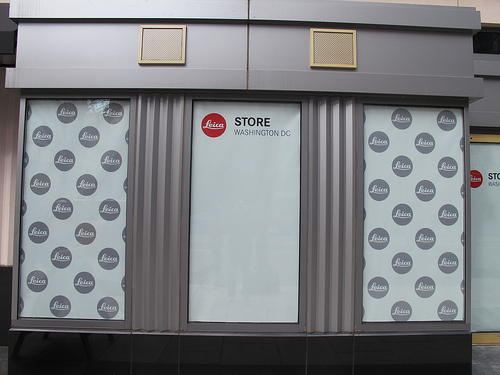 But walking past 975 F St, NW this weekend, while Le Pain bustled, there was still only papered windows next store teasing me with “Leica Store Washington DC”. I know the trend, lately, has been for camera stores to close or downsize but I still have hope for the Leica store.